Keratosis pilaris (KP) is a benign condition that presents as numerous small, rough, red, or tan bumps primarily around hair follicles on the upper arms, legs, buttocks, and sometimes cheeks. KP creates a "goose bumps," "gooseflesh," or "chicken skin" appearance on the skin. In general, KP is often cosmetically displeasing but medically completely harmless and is not infectious. The condition typically begins in childhood and often runs in families. It's frequently seen in atopic dermatitis patients and patients with very dry skin. Many patients note improvement of their symptoms in the summer months and seasonal flares in colder winter months. Some people find that it improves as you get older. The exact cause of KP is unknown. There seems to be a problem with overproduction of the keratin part of the skin called hyperkeratinisation which causes thickening of the skin. Then the hair follicles become blocked with plugs of hard skin, which feel rough. The tiny plugs widen the pores, making the skin look spotty. How can keratosis pilaris be treated? Creams, cleansers and scrubs containing exfoliating ingredients like salicylic acid, lactic acid, glycolic acid and vitamin A have proven to be effective to help restore a smooth texture. 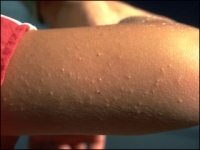 Treatment for keratosis pilaris is ongoing – if discontinued, skin begins reforming around hair follicles. Maintenance is the best way to maintain smooth skin. Sesderma Azelac Lotion It can be applied on the face, body and scalp. - suitable for skin already accustomed to glycolic acid. - suitable for all skin types, especially mature and pigmented. - contains 20% Alpha Hydroxy Acids. Hydration and treatment of acne-prone oily skin.